Enjoying fighting games when you're bad at multiplayer. Whenever I see people talking about frame advantages in fighting games, I understand what the principle of what they're talking about, but I have no idea how I would use that information myself. That's because I don't know what I'm doing when I play fighting games. I don't think I'll ever be able to compete in online multiplayer, so I tend to only play these games offline. In the last few years, as more and more of these games have come to PC, their story offerings have evolved to make this a worthwhile way of playing them. 2011's Mortal Kombat reset was a watershed moment for fighting game singleplayer modes. I was mostly used to the offerings you'd find in Ultimate Marvel Vs Capcom 3 and older console games: slight cutscenes bookending a run through the arcade mode. They had their moments, like Galactus being taken to trial at the behest of Phoenix Wright, but Mortal Kombat united its roster with a larger tongue-in-cheek tale of...well, mostly people hitting each other. And it worked. "2011’s Mortal Kombat had a breadth of single player content that few fighting games achieve," says Dominic Cianciolo, story and VO director at NetherRealm Studios. "It gave players incredible incentive to stay engaged with the game over a longer period of time, which greatly increased the value of the experience." Fun dialogue, well-produced cutscenes and match-ups of fan favorite characters proved to be a compelling formula. This was followed up by Injustice: Gods Among Us, which presented an alternate DC Universe where Superman had become an evil dictator, with the game showing what happens when Batman gathers the heroes of another universe to topple his regime. Mortal Kombat X came after, and the second Injustice, arriving last month after coming out on consoles earlier this year, dug deeper into that universe and presented a new threat—Braniac. Playing each of these campaigns is extremely enjoyable, whether you know fighting games or not. They're never that long, hovering around the five-to-six hour mark, and a lot of the fun is in watching the sometimes bizarre reasons the characters find to fight each other—what other kind of story is punctuated by the need for 40+ one-on-one battles? They're silly in the best way. Injustice 2 has the most gorgeous visual representation of the DC Universe I think I've seen in any media (Arkham Knight aside, perhaps), reaching a great mid-point between realistic and comic book-y—the story mode allows you to feel like you're living in that world. It also understands that the DCU is at its best when it has the tonal range for both serious character moments and a hot superhero couple fighting a talking super gorilla. "Justifying why characters fight is definitely one of the more challenging aspects of writing our story mode scripts," Cianciolo says. "To keep things fresh from game to game, fights must be a natural outgrowth of the story’s plot, the protagonist’s objectives, and the relationship between the protagonist and his or her opponents. The more the stakes for the characters in a particular match up can be personalised, the more satisfying the fight's conclusion will be." Injustice 2 has four credited story staff. Cianciolo explains how their process works. "We begin with one-paragraph pitches of possible story directions. Once we settle on the story direction, the pitch is expanded into a short treatment, a detailed outline, and the ultimately the final script. At each stage, the writing team workshops the script internally, and with Ed Boon, until we feel we’ve crafted a compelling story experience." NetherRealm's story modes have been so successful that they've evidently influenced how other developers have been approaching singleplayer. Recently, we've seen more and more short-but-story-heavy offerings. Marvel Vs Capcom: Infinite misses the mark with poor writing, despite having an immense roster of great characters to draw upon that have a storied history with its audience—it's a real waste. Our reviewer, meanwhile, found Tekken 7's MK-like story offering lacklustre, which is a missed opportunity considering how cool that series' cast is. It's not as simple as throwing in some silly dialogue and drawn out cutscenes, then—the reason Injustice 2's story works is that the developers capture some truth of the characters, even if the situations they're in are ludicrous. I've read DC's books since I was 15. Oliver Queen acting like a swashbuckling hero is exactly how I've always seen him, while Harley Quinn's portrayal feels in line with her current, popular DC incarnation—a step away from her Joker-centric origins. Kevin Conroy's Batman voice is always reassuring, too. "We do a lot of research to make sure we understand each character intimately before we begin writing," Cianciolo says. "Each member of the writing team definitely has favourite characters. Those preferences often influence who becomes the primary writer for a particular character's in-game dialogue. Each of us can then be an advocate for presenting the most polished version of the character possible." "The art to writing the in-game dialogue is to truly understand each character's motivations, in particular why they would fight the other characters. By rooting our dialogue in those established relationships, we give our characters voices that are truly authentic." The result is pretty much the perfect game to blast through on a lazy Saturday afternoon. With each Injustice sequel, there's a chance to bring more heroes and villains into the fold, exposing players to figures they might not have heard of before, although this process is only partially determined by the needs of the story. "There are many stakeholders and design needs that influence which characters make the final roster," Cianciolo explains. "The singleplayer experience is only one consideration when making roster decisions." The main purpose of these singleplayer modes, of course, is to train you for multiplayer bouts. 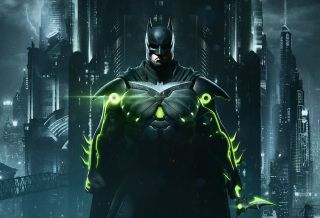 But they've become something bigger than that, mostly because of NetherRealm: an opportunity to further define the game's personality, and a chance to play a story-driven triple-A game that doesn't take itself too seriously. Even if frame advantage will never mean that much to you, they're some of gaming's best comfort food.